I’m wedged in the corner of the cockpit, trying to write by the beam of a puck light and a waxing moon. As we ricochet down the face of one wave and are then shoved back upright by the next, I’m thinking that for me, sailing — and passages in particular — are all about the details. Like the passing of the yellow boots with the changing of watch, the upshot being that they’re always warm so nobody has to suffer cold feet. Or the little head scrunch that comes with my midnight wake up call — the changing of the watch being about the only time we really see each other. Like the steady light of the moon gently bathing our world in its glow (and inciting all sorts of fanciful wording :P)… balanced by the blinding light-in-our-eyes from the pangeros fishing in their little boats, warning us, “crazy Gringo don’t run me down out here!”. Or the full on adrenaline hit of chasing that teeny-tiny little puddle on the floor… to a bilge that’s completely full of water — matched by the terror of knowing you’re technically sinking… but are not yet sure why (answer: top of the rudder post — where we could attach an emergency tiller — is not waterproof with the cockpit floor — and we’d never had it exposed until this trip, so we didn’t know (I hear you dad: “Not knowing is not an excuse!”). A tightened cap and some butyl tape, and sponges in the floor drains to slow the water from getting in to the cockpit in the first place, and we’re happy — and not sinking! — again). Or a new detail, in my world at least… a vague feeling in the pit of the stomach… could it be? After 25 years today is the day I’m going to get seasick? That’s a roger. Puke up the crappy dinner I scraped together (so hard to cook when you’re world is being shaken and sloshed and tossed around!) and then crawl miserably inside to find some Cinarizina — the anti-seizure medicine that, in low doses, works miracles on seasickness too. I won’t ask too many questions… I’m just happy it’s working. Or like the full out bodily pleasure of climbing in to a pre-warmed cocoon of blankets and knowing that you can 100% trust your husband to take care of things while you eke out every.second of snoozing that your 3 hours off will humanly allow (in my case: 2 hours 55 minutes… in poor exhausted Jon’s case: much, much less). 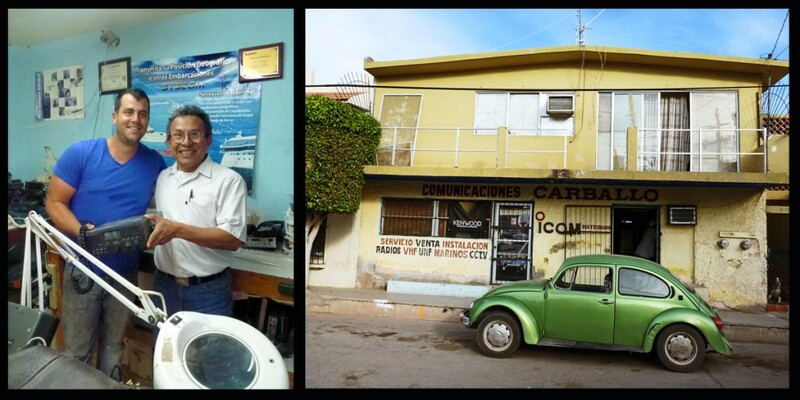 This is Ernesto and his radio repair shop on 19th Avenue in Guaymas (off Serdan). Much to our shock and delight, he took apart and fixed our HAM radio in one day, for $40. Miraculous!! And the tiny thought — quiet but persistent — that wonderful as this is, magical as that moonlight might seem, it will be really nice to just sit somewhere for a while, dig the hammock out of the closet, find an engaging book to read, and just enjoy this watery world that we’re living in. LOVE the video. 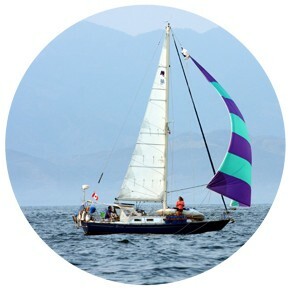 Now just work on point of sail to make it just a little bit more comfortable. Glad to see the harness on! Sounds like it was quite rough. In regards to the emergency tiller post and the leak…on Puffin the rudder post comes up through the aft deck plate. There is; however, the rudder post passes through a nylon bushing and aluminum plate that is shaped like a saucer. I learned this because it was rattling because the screws into the cockpit deck had become loose. I think this this plate is intended to be bedded and screwed tight to keep the water out. Let me know if you’d like to see a pix. This is why it’s so great to know other Nor’West owners! I would love to see a picture if you have a minute — we’ve got our ‘for now’ fix pretty well nailed down and sealed, but a new cockpit floor grate is on the list of projects so we might look at something new when we do that too. The never-ending list of projects continues! Ah yes, those passages – some of your descriptions remind me of what I wrote after our first big passage (Canada – San Francisco) and has me thinking about our upcoming passage to the Marquesas – Funny how we all go through the same hard lessons, realizations and pleasures in some way or other (I particularly remember the warm cocoon that was the sea berth…) Enjoy relaxing now! Thanks Kyra! I was reading your blog and laughing out loud at the list item “have shorter list”… I think I might have to adopt that one over here too! My other favourite is adding items that were never on the dang list to the list, just so you can cross them off of the list 🙂 Will you guys push off from La Paz? Would be fun to cross paths somewhere before your big leap West! Sitting in Alaska this post transports me back and forward to passage making. Exquisite detail makes it real. Be safe. Happiness to you both. Haha thanks c-cubed!! How’s Alaska treating you guys??? You might have to start a “Living in Alaska” blog! !